Turning out to be a HUGE recruiting year for PSU. Two 247sports 3-Star commits in Dylan White (Pitt High) and KeJuan Hay (Owasso High) and some big time players out of Texas and Oklahoma. Last edited by PittGorillaFan; 01-30-2019 at 10:19 AM. Northwest should probably move to the GLVC now, right? Frosty, what's the deal with the AD? You want him gone I know, but what's Sims take? I just want to know what we can do to be more successful across the board in more than just Men's Basketball - thank goodness for that program. One thing I see is that our budget / facilities are closer to the top in Men's Basketball than the other sports. We're still behind in the facilities / funding race, though, across the board by a long way. Are you asking me my take on Sims or Sims's take on the AD?
""" Northwest should probably move to the GLVC now, right? """" It might not be a bad idea - definitely something they should consider. One juco hb maybe out there for Pitt. I think he would be a good get. This might've been noted elsewhere (although, I haven't seen it), but Durand Henderson from Webb City committed to NW. As someone who felt like I was getting punched in the stomach over and over again as I watched him destroy my HS, I was really hoping he'd be at Pitt. Kinda feels like another stomach punch. I think he'll be really good. Congrats NW. Can’t fault the kid for wanting to go to a place and be coached up and win. Not to mention, Beck would have lined him up at long snapper or the place holder for the kicker. He's definitely a downhill guy. One cut and see ya. Jenning kids listed on hudl as a back at 6-4. Listed as Ath on the kpreps deal. I wonder what Pitt will convert him to. looks like 5 for Pitt and 7 for Washburn. Is there anything similar for OK, MO, etc? 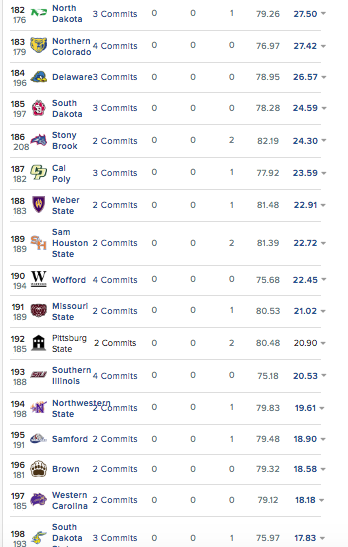 Their big board looks like it mainly lists D1 commits. Hey is not listed as Pitt state yet. Can't hurt recruiting to have a Bearcat D-lineman playing in the SB! Go Matt Longacre! [QUOTE=NW Normal;2347653]Can't hurt recruiting to have a Bearcat D-lineman playing in the SB! Go Matt Longacre! I claim foul. Matt was an obvious ringer that Northwest snuck into Maryville under the cover of darkness. Bearcats are cheaters and should have to forfeit all games that Matt played in. Oh well, good luck in the Super Bowl to Matt and Greg the Leg. I didn't see him in on defense, thought he was in the two deep rotation. Was he in on special teams, or held out for injuries? He had back surgery late in 2017 but was starting early in the season in 2018. Looks like he re-injured it during a game in late October. I saw him during the national anthem and during one timeout.